Diabetic eye diseases are caused by micro vascular disease in poorly controlled diabetics. Diabetic retinopathy is the commonest eye disease among children suffering from diabetes. It leads to early vision impairment or even blindness among teenagers and youths. Glaucoma and cataract are the other two diabetic eye diseases. Can parents control the progress of these eye diseases? How does diabetes damage eyes? Whether it is retinopathy or glaucoma the underlying cause for these complications is diabetic micro vascular disease caused by abnormal fluctuations in blood sugar levels. Normal glucose metabolism is therefore essential for optimal survival of cells. 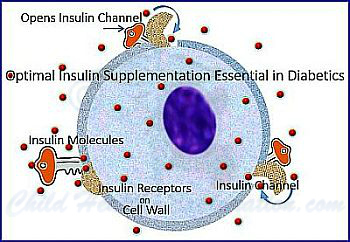 Diagram given below shows normal glucose metabolism at the level of cells, where insulin is the key to insulin receptors on the cell wall. Only in presence of appropriate insulin levels, the insulin channels that are guarded by insulin receptors open up to allow glucose molecules into the cell. 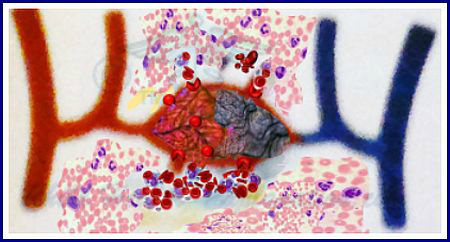 For want of optimal insulin, abnormal glucose metabolism sets in the cycle of small blood vessels destruction -The diabetic micro vascular disease, where the capillary basement membrane gradually thickens, endothelial cell undergo degeneration, and pericyte (fibroblast) cell develop necrotic changes. 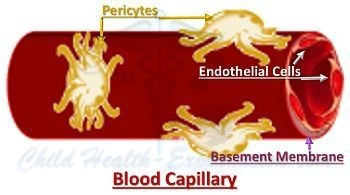 Consequently the capillary walls become thin and fragile, the lumen is gradually narrowed and the blood flow through them is progressively compromised. Diabetic micro vascular disease affects all the organs of the body; heart, brain, kidneys et cetera, and eyes are no exceptions. Mean fasting plasma glucose (FPG), hemoglobin A1c (HbA1c), and duration of diabetes are attributed to development and progression of diabetic eye diseases. Resultant loss of blood supply to light sensitive membrane of the eye, the retina, leads to early vision impairment or even blindness. In modern times, diabetic retinopathy is therefore a leading cause of blindness during late teens and youths. 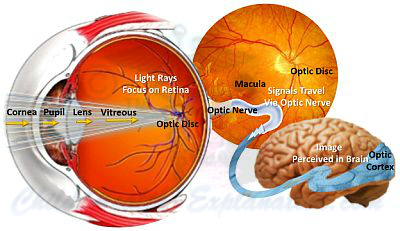 Retina is the innermost light sensitive membrane of the eye. It is made up of specialized cells that have the potential to convert light impulse into signals that are visualized as relevant images at the visual cortex of the brain. 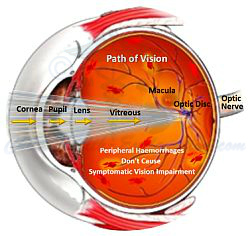 The path light takes through the eye is depicted in the diagram given below. Almost all children suffering from Type 1 Diabetes are at risk of developing some degree of diabetic retinopathy during second decade of their disease. The risk is noted to be a little lower among Type 2 childhood diabetics: 78%. Besides blood sugar imbalance, child’s genetic predisposition also contributes to the risk, for only half of the affected children develop more severe form of diabetic eye diseases, the proliferative diabetic retinopathy. Diabetic micro vascular disease impedes blood flow through tiny blood vessels of retina. Micro aneurysms develop, and damaged vessel wall become leaky; permeable to blood cells, plasma proteins and fats. The exudate gets deposited on the surface of retina. It also causes edema of the retina. Both edema and deposits lead to visual impairment. The edema around macula impairs central vision. This is the first stage of diabetic retinopathy where diabetic teenagers experience reading difficulties, an early sign of near vision impairment. Unfortunately the vision loss that follows retinopathy can Never be reversed, but timely management of diabetic eye diseases can certainly minimize its progression. Undetected and thereby untreated diabetic micro vascular disease progresses into moderate form of non proliferative retinopathy. Eventually the capillaries and small blood vessels of the retina get totally blocked. Inadequate blood supply means reduced oxygen saturation, diminished nutrition and accumulation of harmful metabolites. And at the final stage of non proliferative retinopathy, the starving retina sends signals to generate new blood vessels for want of nutrients and to clear the accumulating garbage. 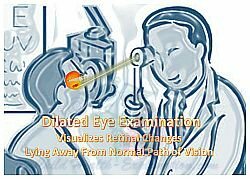 The changes that follow are proliferative diabetic retinopathy. The growth factor is secreted in response to signals received from retina that is starving for oxygen. It triggers development of new blood vessels on the surface of retina. The new blood vessels that are formed are abnormally thin, spiral and fragile, and are unable to restore the lost blood supply. As a result, cobweb like network of blood vessels grows along retina over the optic disc (head of optic nerve) and along the surface vitreous, a clear gel like substance that fills the posterior chamber of the eye. – Hence this stage of diabetic eye disease is known as: Proliferative diabetic retinopathy. 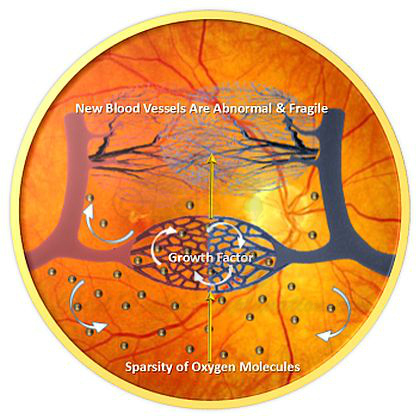 The thin fragile wall of the new blood vessels easily and frequently rupture causing vitreous and retinal bleeds. Blood being opaque obstructs the passage of light rays. The degree of visual impairment that follows depends on the position and severity of bleeds. Peripheral bleeds, that do not interrupt the path of light, do not interfere with child's ability to see. Therefore, in absence of regular eye checkups progression of diabetic eye disease remains undetected and thereby untreated. This leads to loss of precious time in prevention of permanent vision impairment in children that follows secondary to scarring of these missed peripheral vitreous and retinal bleeds. Initial peripheral bleeds usually go undetected unless a diabetic child has periodic dilated eye examination for diabetic eye diseases by an ophthalmologist. All bleeds initiate scar tissue formation that wrinkles and pulls on retina, and may eventually lead to retinal detachment that causes severe vision impairment.